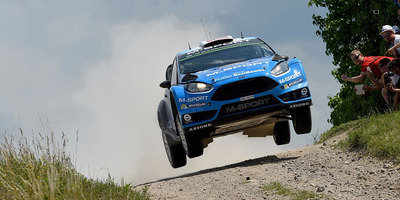 Massimo Bettiol/GettyMads Ostberg of Norway and Ola Floene of Norway compete in their M-Sport WRT Ford Fiesta RS WRC during Day One of the WRC Poland on July 1, 2016 in Mikolajki, Poland. The market capitalisation for cryptocurrencies retested old highs, crossing back over $US600 billion. The market first hit the milestone on December 18. It bottomed out four days later at $US412 billion. You can now practice trading CME bitcoin futures. Wannabe bitcoiners now have a way to try their hand at CME Group’s bitcoin futures market without any risk. CME recently added a bitcoin futures simulation to its CME Institute suite of trading simulation tools. ETHEREUM FOUNDER: ‘I won’t stop or slow working on crypto just because price memes and stupid jokes exist.’ Vitalik Buterin, the founder of Ethereum, has clarified a tweet from Wednesday in which he threatened to leave crypto if communities in the space didn’t grow up. Originally, he said he would leave crypto if all people in the space did was post memes about how much money they had. Ripple briefly overtakes Ethereum as the No. 2 crypto. A red-hot close to 2017 briefly caused Ripple’s XRP to overtake Ethereum as the second-largest cryptocurrency by market cap. Ripple, which focuses on bank transfers, sported gains of more than 40% at one point Friday, propelling it to a record high and a market cap of $US73.65 billion, according to data from CoinMarketCap.com. ‘This is my future’: South Korean students are going wild for bitcoin, even as regulators crack down. Young South Koreans are flocking to cryptocurrency markets, driven by high youth unemployment and promises of big returns.